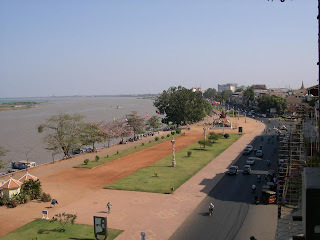 I'm sitting on a riverfront bench in Phom Penh, Cambodia. In my hand there's a bottle of tea, imported from Singapore. Next to me is sitting Fatima (not real name) from Iran. How old are you? Where were you born? - 32. I was born and raised in Isfahan, Iran. - I'm a journalist. I have worked for several mentionable news outlets back in Iran. That's also the reason why I'm here today. So you were critical of the regime? - Not openly... but I have made some suggestions... apparently even that was enough to get prosecuted. So you left Iran and came here. Why? - First, I have no family to worry about. My aim is to get to America. That's why I'm here. I heard some people might be able to help me here in Cambodia. Also, it's easy to get the visa. Have you made contact with your people yet? I wish all the good luck to you, Fatima. Thank you for talking to me. Nice photo, interesting read! I have followed!